My Most Popular K-12 Assembly Program! 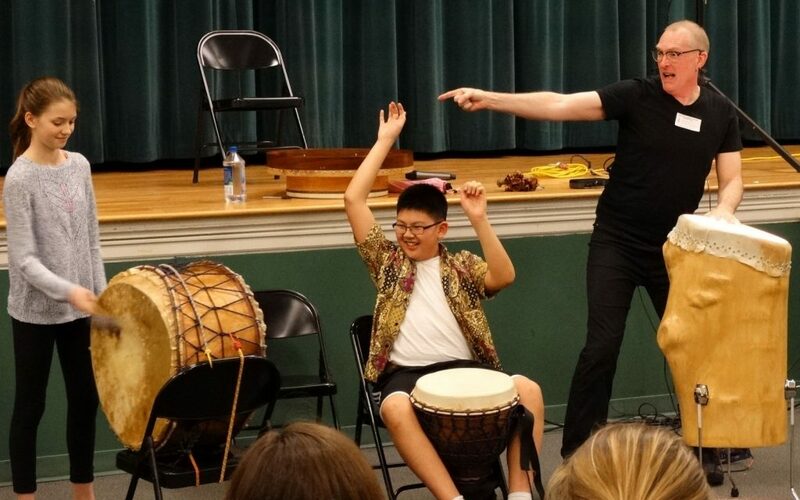 Starting and ending with the haunting sounds of Overtone Singing from Central Asia and making stops around the world, “Beyond the Borders” celebrates how cultures come together and influence each other. Scroll Down and watch each video to experience this program performed live. An old African story that I’ve turned into an “Olde” Irish song. Accompanied by Irish Bodhran and plenty of audience participation. An African welcoming song and rhythm. 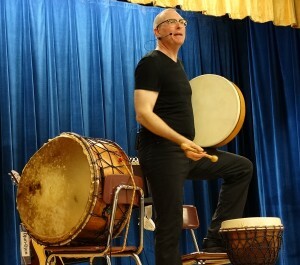 I invite several audience members to join me on stage and with the help of the audience we create an African Polyrhythm. A Native American tale explaining why Coyotes howl and have sharp teeth and why Cicada’s shed their skin. Quite funny with a modest amount of sound effects instruments that I invite a dozen or so audience members to help me with. The rest of the audience assists me as well so there is something for everyone. Also, audiences enjoy the opportunity at the end of the story to get in a good “Howl”. This is an old Irish Story that has a lot in common with many Eskimo (Inuit) tales. Primarily seals that turn into human being and vice versa. I play the wooden whistle at the beginning and the end accompanying the chorus with Bodhran. 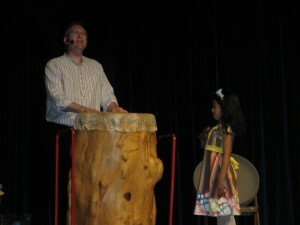 I usually ask for a volunteer from the audience to play the ocean drum as accompaniment. I wrote this song for a family musical called “Letters To Daddy.” It is the perfect piece to end “Beyond The Borders” with because it is all about seeing the world in a new way and working together to make it a better place. Prefer to have me contact YOU? Simply fill out the form below! Thanks for your interest!